The "Middle Ages" and the "Normans"
The Norman invasion and Battle of Hastings in 1066 changed the English way of life for ever. The country was quickly suppressed through the strategic positioning of Norman mottes (earthen castles with wooden palisades), some of which also had outer baileys. Walldown in Whitehill may be an example. Feudalism was introduced and the Domesday Book of 1086 was compiled to introduce taxation. It is here that we find the first references to local places such as Headley Mill. The Royal Hunting Forest of Woolmer was created and hunting lodges established by King John at East Worldham and Edward I at Woolmer. The landscape would have been far more open with people eking out a forest edge existence, with illegal holdings (assarts) literally carved from Royal lands. In Mediaeval times the term Forest is not synonymous with woodland - it means an area that is subject to Forest Law - the areas included a variety of habitats - dry heathland, bog, fenland, open water, pasture and woodland. Woolmer always appears to have been a Hunting Forest - names like "Whitehill Chase" indicate an open area of land in which quarry species (deer, boar etc...) were pursued. Alice Holt however was probably a managed woodland. A number of historic mediaeval commons still exist today - Slab, Shortheath, Broxhead and Kingsley. These areas of land were not open to all but only to those who held commoner's rights. These rights were not always written down and were often held by families through custom and tradition. This is why commons were so easy to enclose in the eighteenth and nineteenth centuries as a largely illiterate peasantry had no written records or recourse to law to defend their rights of common. Rights of common included activities such as the right of pasture (grazing), estovers (the right to gather fallen wood), pannage (the right to graze pigs) and mining. In 1230 we get the first reference to Bordon - "Burdunesdene" - when broken it to its component parts we get "burh" (a fortified place), "dun" (a hill), "dene" (a valley) so like many place names a topigraphical description - literally a hillfort above a valley. The suggestion that Bordon is derived from "Boar's Den" is not worth serious consideration as these are modern phrases and it bears no resemblance to the original spelling. The first reference to Whitehill - "Whitestigele" comes in 1270. Again its a topigraphical reference ie. a steep white landscape feature that "sticks up" above the plain. (White due to the bleached sand). In 1254 the Great Chapel of Blackmoor was erected but it had disappeared by the sixteenth century. Its exact whereabouts is uncertain although clues remain in local place names. West of Whitehill behind Blackmoor Golf Course lies the Warren. This was used to breed coneys (rabbits) brought in by the Normans for food and fur (rabbit was then a luxury item). There was almost certainly another chapel at Oakhanger dating from the thirteenth century. 1269 sees the first reference to Lindford. Pontem de Lindford (1269) later Lyngefordes Brygge (1298) indicates that there was a bridge over the ford in the River Wey. The first element of the place name almost certainly refers to "Ling" a local name for Heather rather than being derived from "Linden (Lime) trees or "Lin" (Flax). In 1240, Henry III granted 6 acres of land from his Manor at Blackmoor to the Knights Templar, who held a manor and preceptory at Sotherington between Blackmoor and Selborne. The order of Knights Templar was brutally suppressed by the Church in 1312 on grounds of Heresy. 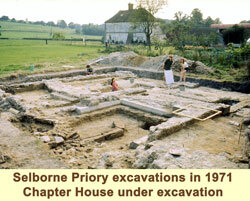 The Priory of St Mary was established at nearby Selborne in 1233 by Bishop Peter de Roches for the Austustinian Canons (a former Knight of King John who had become Bishop of Winchester). In 1260 Robert de Sanford (Master of the Knights Templar) gave the priory a right of way to drive cattle and carts between Sotherington and Blackmoor. The Priory was closed in 1486 well before the Dissolution of the Monasteries under Henry VIII. In 1350, we get the first reference to "la Hollywatre juxta iueleybrigg" (Hollywater) viz. the Holy water next to the bridge. Hollywater has an ancient landscape and is designated as an Area of Special Landscape Quality (ASLQ). The Holly probably relates to sacred or healing springs rather than Holly trees which are certainly common here. There is certainly a spring line in the area and springs still rise on the Walldown Triangle and until the 1980s in the Deadwater Local Nature Reserve. The River Hollywater becomes the Deadwater as it approaches the bottom of Deadwater Hill (now Chalet Hill) and appears to have been used for flooding pastures since the middle ages. Hollywater Pond (owned by the National Trust) is also of local importance. Oral tradition has it that there was a pest house at Hollywater, again something possibly related to the healing properties of the water. This however is conjecture. Hollywater contains the oldest buildings in Whitehill Parish and our only listed building. According to the records there appears to be a deserted mediaeval village (DMV) at Hollywater. The exact whereabouts is uncertain - given the age of some of the houses it is more likely to be a "shrunken village". The first reference to Oxney dates from 1223. The name Oxene (Oxney) seems to suggest that this was a cattle farm - the area is very lush being on a flood plain. The River Sal (from Selborne) has becomes the Oakhanger Stream by the time it flows through here and eventually becomes the River Slea. Oxney is found along the old drove road from Bordon to Kingsley (remains of the Hollow way being very much in evidence). 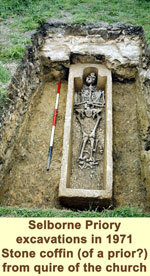 Late Mediaeval pottery dating from the fourteenth century has also been found here. You can zoom in and out by clicking the PLUS and MINUS symbols on the maps top left. You can drag and change the maps center position with your mouse. Add or remove features by selecting the PLUS symbol top right of the map. The YELLOW symbols on the map are clickable for more information on that site.